Everything that goes down any of the drains in the house (toilets, showers, sinks, laundry machines) travels first to the septic tank. The septic tank is a large-volume, watertight tank which provides initial treatment of the household wastewater by intercepting solids and settleable organic matter before disposal of the wastewater (effluent) to the drain field. Microbes in Septic Tanks Digest, Dissolve, and Gasify Complex Organic Wastes. While relatively simple in construction and operation, the septic tank provides a number of important functions through a complex interaction of physical and biological processes. 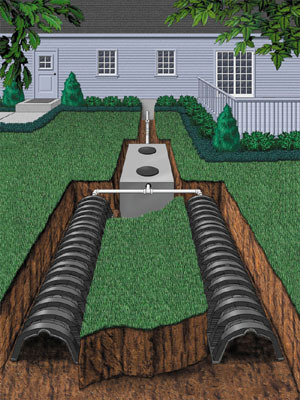 The essential functions of the septic tank are to: receive all wastewater from the house separate solids from the wastewater flow cause reduction and decomposition of accumulated solids provide storage for the separated solids (sludge and scum) pass the clarified wastewater (effluent) out to the drain field for final treatment and disposal. As stated, the main function of the septic tank is to remove solids from the wastewater and provide a clarified effluent for disposal to the drain field. The septic tank provides a relatively quiescent body of water where the wastewater is retained long enough to let the solids separate by both settling and flotation. This process is often called primary treatment and results in three products: scum, sludge, and effluent. Scum: Substances lighter than water (oil, grease, fats) float to the top, where they form a scum layer. This scum layer floats on top of the water surface in the tank. Aerobic bacteria work at digesting floating solids. Sludge: The "sinkable" solids (soil, grit, bones, unconsumed food particles) settle to the bottom of the tank and form a sludge layer. The sludge is denser than water and fluid in nature, so it forms a flat layer along the tank bottom. Underwater anaerobic bacteria consume organic materials in the sludge, giving off gases in the process and then, as they die off, become part of the sludge. Effluent: Effluent is the clarified wastewater left over after the scum has floated to the top and the sludge has settled to the bottom. It is the clarified liquid between scum and sludge. It flows through the septic tank outlet into the drain field. Effective volume: The floating scum layer on top and the sludge layer on the bottom take up a certain amount of the total volume in the tank. The effective volume is the liquid volume in the clear space between the scum and sludge layers. This is where the active solids separation occurs as the wastewater sits in the tank. wastewater needs to sit long enough in the quiescent conditions of the tank. Retention Time (days) = Effective Volume (gallons)/Flow Rate (gallons per day) A common design rule is for a tank to provide a minimum retention time of at least 24 hours, during which one-half to two-thirds of the tank volume is taken up by sludge and scum storage. Note that this is a minimum retention time, under conditions with a lot of accumulated solids in the tank. Under ordinary conditions (i.e., with routine maintenance pumping) a tank should be able to provide two to three days of retention time. As sludge and scum accumulate and take up more volume in the tank, the effective volume is gradually reduced, which results in a reduced retention time. If this process continues unchecked-if the accumulated solids are not cleaned out (pumped) often enough-wastewater will not spend enough time in the tank for adequate separation of solids, and solids may flow out of the tank with the effluent into the drain field. This can result in clogged pipes and gravel in the drain field, one of the most common causes of septic system failure. In order to avoid frequent removal of accumulated solids, the septic tank is (hopefully) designed with ample volume so that sludge and scum can be stored in the tank for an extended period of time. A general design rule is that one-half to two-thirds of the tank volume is reserved for sludge and scum accumulation. A properly designed and used septic system should have the capacity to store solids for about five years or more. However, the rate of solids accumulation varies greatly from one household to another, and actual storage time can only be determined by routine septic tank inspections. sludge. While a certain amount of volume reduction occurs over time, sludge and scum layers gradually build up in the tank and eventually must be pumped out. The inlet and outlet ports of the tank are generally equipped with devices such as baffles, concrete tees, or in more recent years, sanitary tees (T-shaped pipes with one short and one long leg). The inlet device dissipates the energy of the incoming flow and deflects it downwards. The vertical leg of the tee extends below the liquid surface well into the clear space below the scum layer. This prevents disturbance of the floating scum layer and reduces disruptive turbulence caused by incoming flows. The inlet device also is supposed to prevent short-circuiting of flows across the water surface directly to the outlet. The upper leg of the inlet should extend well above the liquid surface in order to prevent floating scum from backing up into, and possibly plugging, the main inlet pipe. The open top of the inlet tee allows venting of gases out of the tank through the inlet pipe and fresh air vents of the household plumbing. The outlet device is designed to retain the scum layer within the tank. A sanitary tee can be used with the lower leg extending below the scum layer. The elevation of the outlet port should be 2 to 3 inches below the elevation of the inlet port. This prevents backwater and stranding of solids in the main inlet pipe during momentary rises in the tank liquid level caused by surges of incoming wastewater. Gases are produced by the natural digestion of sludge at the bottom of the tank, and particles of sludge can be carried upward by these rising gases. Some tanks have a gas deflection baffle, which prevents gas bubbles (to which solid particles often adhere) from leaving the tank by deflecting them away from the outlet and preventing them from entering the drain field. In newer systems, there is often an effluent filter: one of the significant improvements in septic tank design in decades. They range from 4 to 18 inches in diameter. As we have described, the most serious problem with septic systems is the migration of solids, grease, or oil into the drain field, and the filter is effective in preventing this. A filter restricts and limits passage of suspended solids into the effluent. Solids in a filtered system’s effluent discharge are significantly less than those produced in a non-screened system. The septic tank also provides a buffering of flows between the house and the drain field. Large surges from the household, such as toilet flushing or washing machine drainage, are dampened by the septic tank so that the flows leaving the tank and entering the drain field are at substantially lower flow rates and extend over a longer period of time than the incoming surges. though they had been bitten, and similar signs of decomposition were visible in the case of other substances. Of the skinned animals, the skeleton alone remained after a short time; with the unskinned animals the process lasted rather longer. At this stage I will only point out that the experiments were so arranged that no portion of the substances could be washed away; their disappearance was therefore due to solution and gasification."